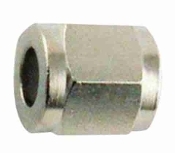 Swivel nut with 1/4" FFL connection. Accepts a barb on one end and anything with a 1/4" MFL connection on the other end. Hose clamp may be needed for a tight fitting.